This is a great development for Mayer’s career, but it’s even better for Google. Here’s why. That’s because what Mayer may achieve with Yahoo would change how Google does business and the political and technological spaces that it operates within. Let’s take a look at what this means. It’s fair to say that Marissa Mayer wasn’t the most beloved Googler to ever roam the halls in Mountain View. Back in 2009, then top-designer Doug Bowman left Google under something of a cloud. Posting a pithy blog about the matter, Bowman noted that one of the key reasons was that the management above his team weren’t actually trained in the disciplines of design. Without a person at (or near) the helm who thoroughly understands the principles and elements of Design, a company eventually runs out of reasons for design decisions. With every new design decision, critics cry foul. Without conviction, doubt creeps in. Instincts fail. “Is this the right move?” When a company is filled with engineers, it turns to engineering to solve problems. Reduce each decision to a simple logic problem. Remove all subjectivity and just look at the data. Data in your favor? Ok, launch it. Data shows negative effects? Back to the drawing board. And that data eventually becomes a crutch for every decision, paralyzing the company and preventing it from making any daring design decisions. This is an unmistakeable dig at Mayer, then head of User Experience. Bowman even pointed out the truth that Mayer’s team once exhaustively tested 41 shades of blue for an element of a design–a move that is in keeping with Mayer’s seeming love of data above all else. She famously turned down a Googler’s application once because the applicant had a single “C” grade in something, representing an imperfection in his data as far as Mayer was concerned. Now that Mayer’s gone, perhaps cooler heads will prevail in deciding some of Google’s key code and design issues. 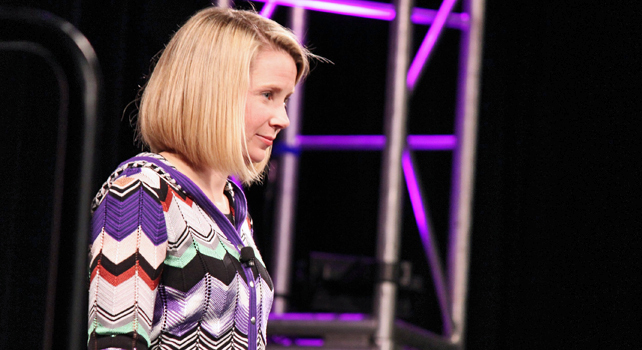 Marissa Mayer is an honors graduate from Stanford University, holding a B.S. in symbolic systems and an M.S. in computer science. She also has an honorary doctorate degree from the Illinois Institute of Technology. Her Wikipedia page also notes that before joining Google she worked at the UBS research facility in Zurich and at SRI International (a contract-based research institute) in California. Neither job lasted very long because she then joined Google in 1999 as employee number 20, its first female engineer. What this boils down to is this: Mayer is very smart and has ascended through Google’s management levels, but she has never been solely responsible for running a company this large. Her expertise in artificial intelligence and search and her reportedly powerful drive will likely lead her to make some sweeping transformations at Yahoo. She may, hopefully, turn the company around. Additionally, while Yahoo has strong Hollywood ties, and its previous interim CEO Ross Levinsohn was once president of Fox Interactive Media, Yahoo is at heart a technology firm that delivers a plethora of services to its customers–whom it then profiles so it can sell advertising. This is what lies beneath all of Yahoo’s offerings, especially search, and it’s Mayer’s bailiwick. Less Hollywood stooge, more media geek. Mayer worked at Google for 13 years. When she acts to tweak and polish Yahoo, her former colleagues in Google will have a pretty good idea about what she’s doing. And it’s always handy to be able to make a highly informed guess about what your competition is poised to do next. For Google, this means it can spend less time wondering and worrying about Yahoo’s plans, and more time innovating products that the market truly wants.